What’s New in the Magic Kingdom: Lots of New Eats and Construction Updates, Plus New Dooneys, Shirts, and More! Wow! What a visit to the Magic Kingdom! We tried the BRAND NEW Mickey and Minnie Waffle Sundae, Mickey and Minnie Whoopie Pies, and Casey’s Hot Doggitiy Dog of the Month. 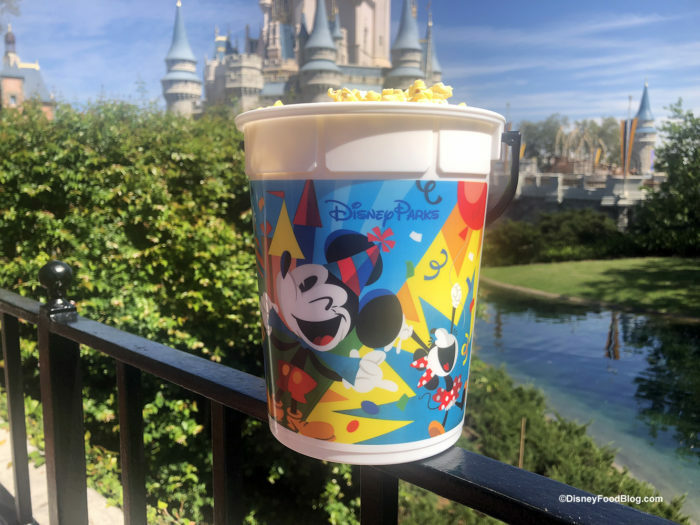 Plus, we added to our popcorn bucket collection with a just released popcorn bucket. And that isn’t everything — we found a new Dooney and Bourke collection, new shirts, new salt and pepper shakers….and still so much more! Read along to learn about all the new items in and updates from the Magic Kingdom! Mickey Sippers are BACK In Stock in Walt Disney World — But What’s Up With the Price?! 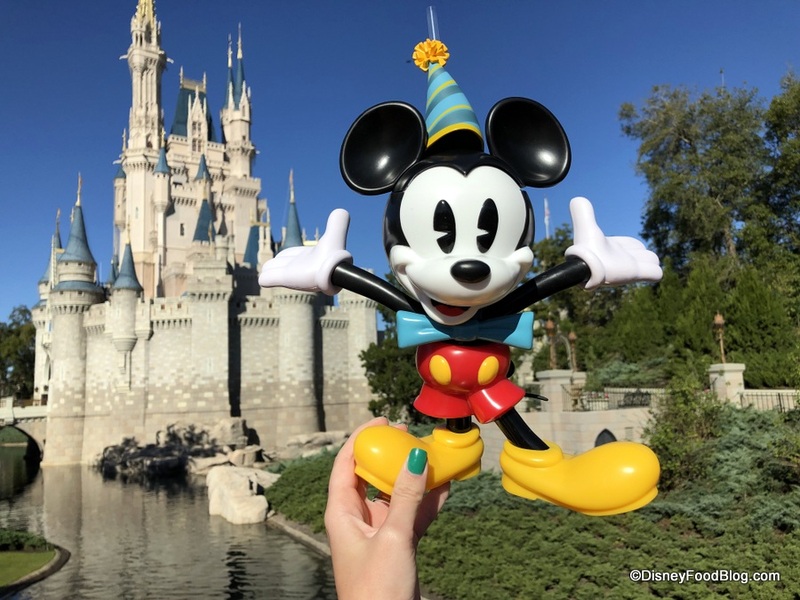 Walt Disney World guests looking to pick up the adorable and festive Mickey Sipper last week were disappointed to discover that it was sold out at locations in Magic Kingdom. If you recall, this expressive vessel arrived on the scene to celebrate Mickey’s 90th birthday back in November, and it stuck around for the celebration into the new year! and to reminisce about Mickey’s birthday party! ALERT! 2319 Emergency Monster’s Inc. Cupcake Pops Up in Disney World For One Day Only! OK, this is AWESOME! Thanks to my instagram buddy @elbellfromarendelle for tagging us in this great news! 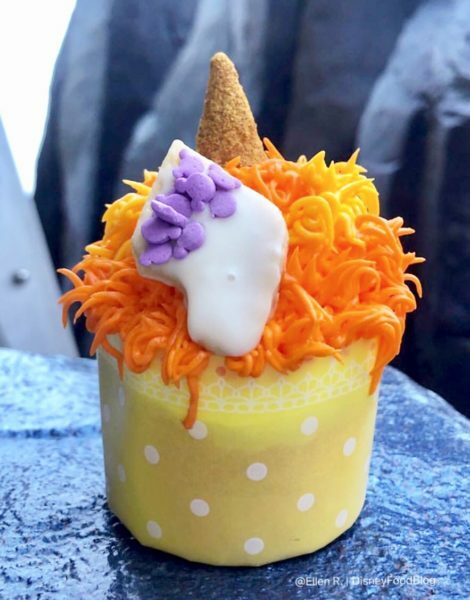 There’s a 2319 Emergency Cupcake at Disney World’s Magic Kingdom today to celebrate 2-3-19! No idea what a 2319 Emergency is? (It’s OK — some of us had to google it, too!) In my favorite Disney movie, Monster’s Inc., you’ll remember the 2319 Emergency when an unfortunate monster was contaminated with a child’s white sock — a dreaded outcome for any scarer!! Well the Magic Kingdom pastry chefs (Jenna Rose Petri, specifically) came up with an incredible idea to celebrate this one-time-only day! 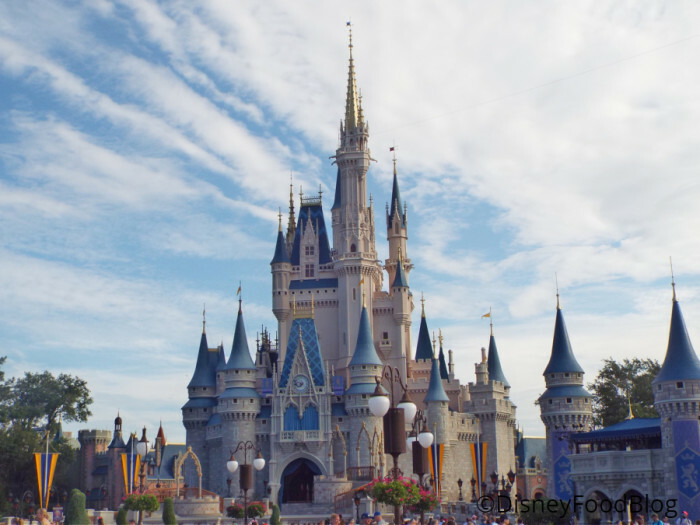 What’s New in the Magic Kingdom: Celebration Sweets, Meet and Greets, Construction, and more! Hello from a chilly Magic Kingdom! We found some rarely-seen characters, celebration sweets, St. Patrick’s Day Mickeys, new Funko Pops, and more! Hello from Robin Hood and Little John in the Magic Kingdom! 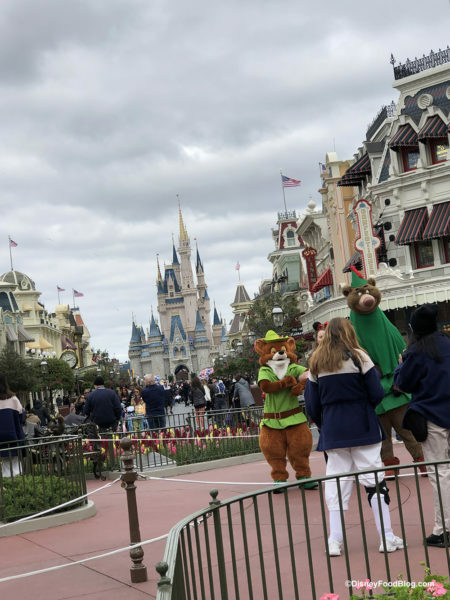 Look who we saw this week as part of the Mickey and Minnie Surprise Celebration visits from rarely-seen-in-the-parks characters — that’s Robin Hood and Little John! It’s time for another festival to start! Check out all the details on the 2019 Epcot Festival of the Arts, which begins this Friday – January 18, including FULL menus and lots of food photos! We’ll be there reporting live, so stay tuned to DFB’s instagram, twitter, and newsletter! Check out the booth updates and more for the Festival of the Arts. Peter Pan’s Flight is closed for refurb! When will it reopen? You won’t believe the price of this limited edition Disney gift card! What’s new at Epcot this week? Check out the details about booking a Disneyland vacation before prices increase. We have all the details on what’s new at the Magic Kingdom. Troll Horns have returned to the Kringla Bakeri og Kafe! We reviewed a new snack at Tortuga Tavern in the Magic Kingdom. There’s a new Cinderella Cupcake at the Main Street Bakery! Check out the food and merchandise coming to the Get Your Ears On Celebration at Disneyland. New Passholder benefits announced for Festival of the Arts. Check out the new Alex and Ani Disney food-themed bracelets! There’s a new Wreck-It-Ralph Sundae in Disney Springs. Reservations are now available for Toledo – Tapas, Steak, and Seafood at Coronado Springs. Check out all the NEW Potion Purple merchandise at Disney World. We spotted new Mickey Donut and Pizza handbags from Danielle Nicole at the Magic Kingdom. Check out the latest construction updates from Epcot. 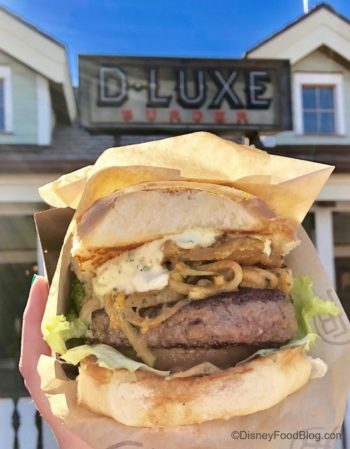 We reviewed the new limited time menu items at D-Luxe Burger in Disney Springs. More pop-up shopping experiences are coming in 2019 for Annual Passholders! It’s never too early to start thinking about the holidays at Disneyland. You’ve got to check out this new Disney food-themed merchandise. Cosmic Ray’s Starlight Cafe is undergoing some refurbishments. Check out what’s new at Disney’s Hollywood Studios. Check out these fun finds from the runDisney Expo. We have menu items and prices for the Lunar New Year at Disney California Adventure. The opening date and menu were announced for Ballast Point at Disneyland. We have the latest details on the Epcot World Showcase Wine Walk. Check out these first-timer FAQs about Disney vacation planning. Disney Springs restaurants and shops are offering discounts for Marathon participants. We reviewed the Ultraviolet Purple Cake Pops in Disneyland. We have updates on the construction at Disney’s Hollywood Studios. Check out the 2019 Valentine’s Day merchandise at Disney World! Construction walls are up around Disneyland’s Sleeping Beauty Castle. Check out the new Celebrate Mickey merchandise at Disney World. We reviewed the new Maple Bacon Chocolate Chip Cookie Dough in Disney Springs. We are loving the new Loungelfy line of merchandise featuring iconic Disney food. There’s a new cotton candy-infused cupcake at Port Orleans Riverside. Check out the amazing new eats at Disney’s Blizzard Beach. We have details on the new IllumiNations Dining Package coming to Epcot. You’ve got to see these new Minnie Mouse Donut Ears at Disneyland. Mickey Ice Cream Bars might be at a grocery store near you very soon. Check out the new concept art for Jaleo – coming soon to Disney Springs. We spotted a new Mardi Gras cupcake at Disney’s Port Orleans French Quarter. NEW Buffalo Chicken Springs Rolls have arrived at the Magic Kingdom. There are so many purple treats at the Disney Parks and Resorts. Check out the new Buzz Lightyear ears at Disney World. We checked out the menu at the Sunshine Day Bar in Hollywood Studios. There’s a special Disney Vacation Club member event at the Festival of the Arts. We checked out the new menu at Backlot Express at Hollywood Studios. Check out the new line of Rock the Dots merchandise! New DFB YouTube videos: 10 Not-So-Magical Truths About Disney World, The Best Time to Go To Disney World in 2019, How Disney Gets You to Spend More Money, and What to Eat When You’re Tired of Sweet. What’s New in the Magic Kingdom: Sweet and Savory Eats, Purple Everywhere, Refurbs, and More! Happy Greetings from Magic Kingdom! This visit found sweet treats for your sweetheart, purple treats, savory spring rolls, new chips, the closure of a favorite ride, a pretty sparkly gift card, plus more! Let’s jump in! Where else do you start a visit to the Magic Kingdom but in the oh-so-sweet Main Street Confectionery!! Cosmic Ray’s Starlight Cafe in Walt Disney World’s Magic Kingdom is a guest favorite. It’s here you’ll find burgers, chicken, and the occasional limited time offering (like these funky Galaxy Fries and the lauded Pork Belly Burger)! But the popular quick service spot is currently undergoing a refurbishment — partially. At present, construction walls are up around Bay 2, where you’d typically find a selection of burgers, sandwiches, and salads. The walls extend through the central seating area (the largest section of seating in the restaurant), including around the stage where diners would normally spot Sonny Eclipse. 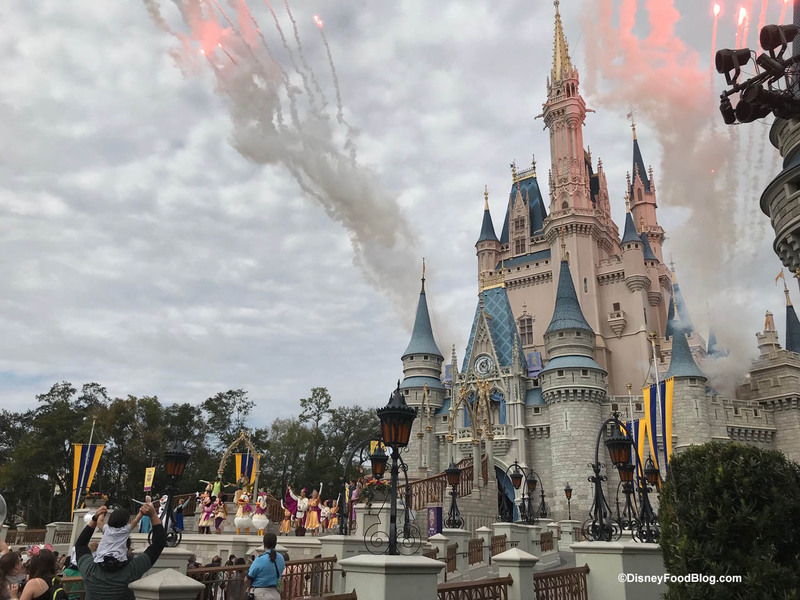 Riverboat News, Holiday Sale Items, the Guest Experience Team, and Galaxy Fries: Everything New in the Magic Kingdom this week! 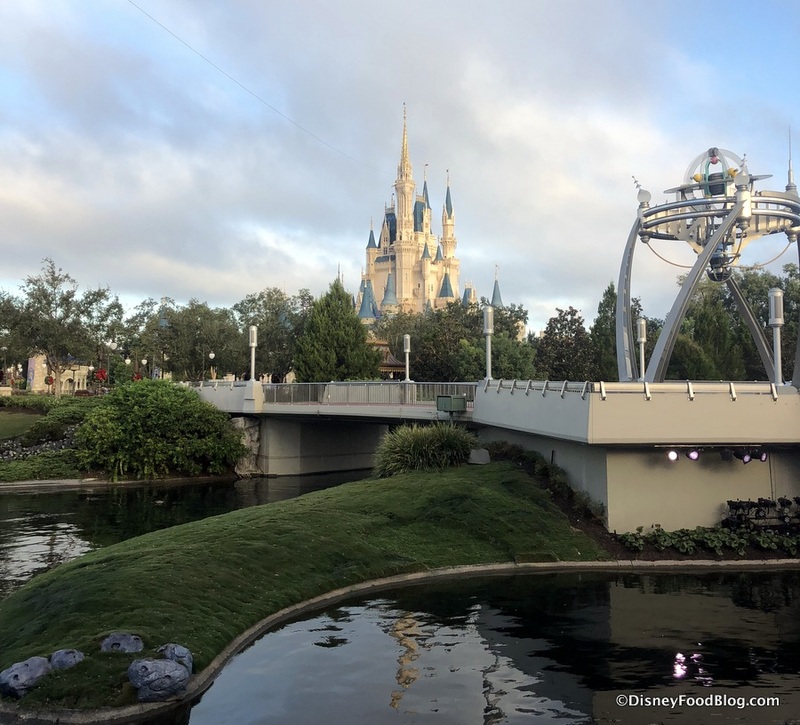 What’s new at the Magic Kingdom in Walt Disney World this week? We’re glad you asked! 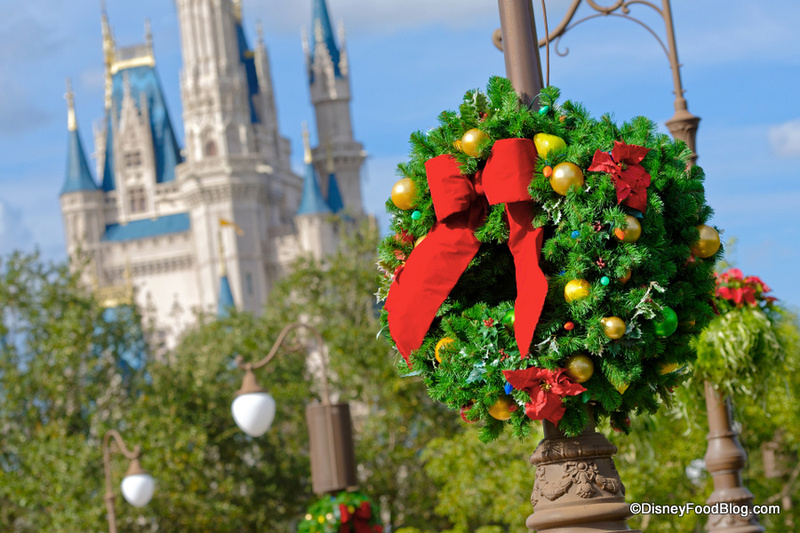 From updated menus to holiday sale items and Guest Experience kiosks to new merchandise, Magic Kingdom has it all! Let’s take a walk through the park, shall we?